Following Nick’s announcement at this year’s UK Hypnosis Convention stating the he is stepping down as organiser of the UKHC, I (Adam Eason) wanted to make the formal announcement that I am going to be picking up the reins of the UK Hypnosis Convention, along with a team of colleagues and fellow professionals who have been involved with the convention to date and who I work alongside for the PHN (Professional Hypnotherapy Network) organisation. Firstly, I wanted to offer up my thanks to Nick, though no longer organiser, he will always be the founder – he has created something truly wonderful here and the love that everyone has for him was evident this year more than ever (I am recalling watching him up on stage at the end of the gala dinner with the crowd chanting his name). This makes my own task going forward even more daunting. I have been involved with the convention since it’s conception when I was asked to be the keynote speaker in it’s inaugural year. 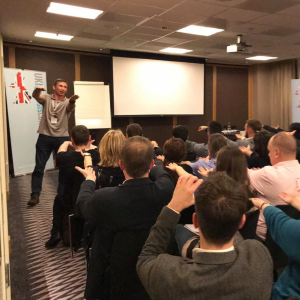 As Melissa mentioned during her own keynote this year, I had spoken of the need to unite, to learn and develop from some of the differences and diversity within our field and I firmly believe that the UK Hypnosis Convention has done that to date. The tone, the manner and attitude of those present in previous years has suggested to me that the field is more than capable of growing together further in years to come. Those that promote and embody this ethos are at the heart of this convention and the vision I have for it. The convention will remain largely unchanged from this year’s very popular event. We will be adding subtle changes where we think it will improve the event, and some of those will be apparent already. One of the things that is at the heart of my own ethos and approach is to seek to advance our field – one of the ways of doing this is to help bridge the gap that exists between researchers and the academic fraternity in the hypnosis (and related neuroscience and psychology) fields with the frontline hypnotherapists – so my main initial influence will involve bringing in well-known researchers, academics and scientists to present at the convention in addition to all the existing people who have contributed so much value to the past 3 events – which I hope will offer great value, education and inspiration to all who choose to attend. We are already working hard and dedicating ourselves to the convention behind the scenes. Helping organise things alongside me will be my colleagues Lindsay Shepherd, Steve Baxter (who has been working tirelessly on the website, implementing some of the subtle changes we’ve made), Annalise Kirk, Tara Foulkes, Etain McNulty and Sarah Mortimer. For starters, we are delighted to announce that we have confirmed the dates for the 2019 UK Hypnosis Convention! The 3 days of the convention will be November 8-10 (Friday the 8th to Sunday the 10th), with pre and post convention workshops either side making it a full blown 7-11 event. Get the dates in your diary. We’ll be returning to the Renaissance Hotel in Heathrow. Lindsay has been liaising with the hotel and we’ve taken on board much of the feedback people had following this year’s event and are doing all we can to build and improve upon this year’s experiences there. Much of the format will be the same, but we have plenty of freshness to enliven your senses that we’ll be announcing in coming weeks. We announced it on social media yesterday and wanted to also let you know that speaker applications for the 2019 UK Hypnosis Convention are now open. Please read the page carefully before completing it as it outlines the criteria that the committee will be using to assess applications. We’ve been delighted with the number of applications we’ve received in such a short time already and hope as many of you as possible will apply. There will be further announcements in the lead up to Christmas as early bird tickets will go on public sale soon – there will be a healthy discount for those investing before the speaker line-up is announced in February. If you would ever like to speak to me, Lindsay, Steve or any of the team to offer your ideas, thoughts and feelings, share your experiences or give feedback, please do so. We welcome it and will be responsive where possible in order to continue the positive momentum that we have at present and help make a major contribution to the worldwide hypnosis field.